Please note that I will add further modules later and that, on request, different parameters can be used in the calculation. The data in the graphic is real and was generated for a report published by a German university for a large metering customer. The report was presented during an NB-IoT seminar September 2017 with Deutsche Telekom in Bonn. In the study, 512 bytes were transmitted by the NB-IoT module in 17 separate data packets. Based on this we deduce that each packet is 30 bytes long. On the first quick look, we detect 30 bytes per burst. The 512 bytes was transmitted by UDP/IP. On second look another page is showing a comparison from 8 bytes, 140 bytes in comparison to text message (SMS), 200 bytes up to 512 bytes and everything in between. On better link budget than 144 the energy consumption will be already lower than mentioned 5.64 per byte. NB-IoT is very dynamic in the energy consumption. As soon non-IP is supported by Deutsche Telekom we can save energy by removing the 12 byte UDP header. The report contains the energy consumption for an as well. The first 1.7 seconds are related to the attach to the NB-IoT BTS. After that several bursts of 30 bytes follow. At the end of the bursts will follow go to sleep or wait for an incoming message. A reattach with a search for new BTS will raise the energy by 2.3 (5.65 mWs x 2.3 or 7.74×2.3). As soon the new Quectel BC66 and BC68 are tested with two new chipsets I will rework the calculation. The energy consumption of a Weightless end device I got on request. I asked for the energy consumption of just 12 bytes. 12 bytes is a negligible packet length. Weightless has no limitation on duty cycle because it uses Listen-Before-Talk, FDMA, TDMA, and frequency hopping. Weightless offers a maximum throughput of 100 kB/s on a single channel of just 100 KHz. The power consumption of the LoRaWAN module was calculated by the LoRa Calculator with spreading factor 12. LoRaWAN is only able to offer a maximum throughput of 36 kB/s on three channels with 3×125 KHz = 375 KHz bandwidth. Based on the Aloha effect the network will experience a package loss of 82 % at maximum throughput. On top of Aloha, you have a “blind” gateway during gateway on TX on top. The maximum “blind” time is 10% of one hour. Furthermore, there is the loss of packages on 20 dB dynamic range. A package on for e.g. SF7 with 20 dB higher RSSI level will block packages on SF11 or SF12 easy. There a lot of more but Link Labs is a LoRaWAN Alliance member with high skills. The power consumption of SIGFOX you can calculate easily. They will transmit each message three times. Europe => 3 x 2 seconds = 6 seconds airtime. USA => 3 x 385 ms = 1155 ms airtime. Energy = Voltage x Current x Time. BTW, 2 seconds is a long time for a radio to be active. The longer the time on air the higher the chance a package loss. The longer the time on air the higher the power consumption. Remember that any of the three repeated SIGFOX messages will always contain the full header of 12 bytes followed by 12 bytes of data. 50% of a SIGFOX message is protocol overhead. We calculated the energy consumption using the Wisol WSSFM10R1AT data sheet with 3.3 Volt and 65 mA at 13.5 dBm Tx power. The calculated the energy consumption of the STM S2-LP chipset is based on 15 dBm because we calculated 1 dB loss in the matching circuit to achieve the 50 Ohm impedance. All LPWAN technologies in the unlicensed band will interfere each other. Based on the Aloha effect a package loss on collision with nodes within the operator’s own network is common. As soon two or more LoRaWAN gateways from other parties are coexisting in the same physical space than they will interfere each other. If your country has a SIGFOX network then SIGFOX and LoRaWAN will interfere each other. Weightless, with its 100 KHz channel width, can avoid the 192 KHz frequency range of SIGFOX. The only problem left is LoRaWAN. LoRaWAN will use 375 KHz out of silver 600 KHz. Between 2 LoRaWAN channels, there is a gap of 70 KHz remaining. Weightless uses a channel backlist. Worst case only 5 of 8 channels will be used to avoid package loss. If you run a small private LPWAN in a factory plant then you will need to plan for anticipated package loss using LoRaWAN. Best case, the number of nodes is so low that you have no problem with the Aloha effect. Far away nodes will not interfere with your own IoT devices. Maybe a cheap single LoRa gateway will do the job. A single gateway on a modern protocol without Aloha-based protocol will offer a better performance than a 3-channel gateway with 82% package loss. As soon as the network reaches even a medium size in terms of end device count and number and size of uplink transmissions a Weightless base station is the best choice. Weightless only requires 100 KHz bandwidth and reduces package loss substantially using modern features like LBT, FDMA, TDMA, and frequency hopping. If you need maximum throughput in download then LBT, TDD, and TDMA is also the perfect combination. Time Division Duplex (TDD) will ensure those end devices to attempt uplink communications whilst the gateway/BTS is transmitting. The upper calculated energy consumption is the net power consumption. It shows you the best-case power consumption. 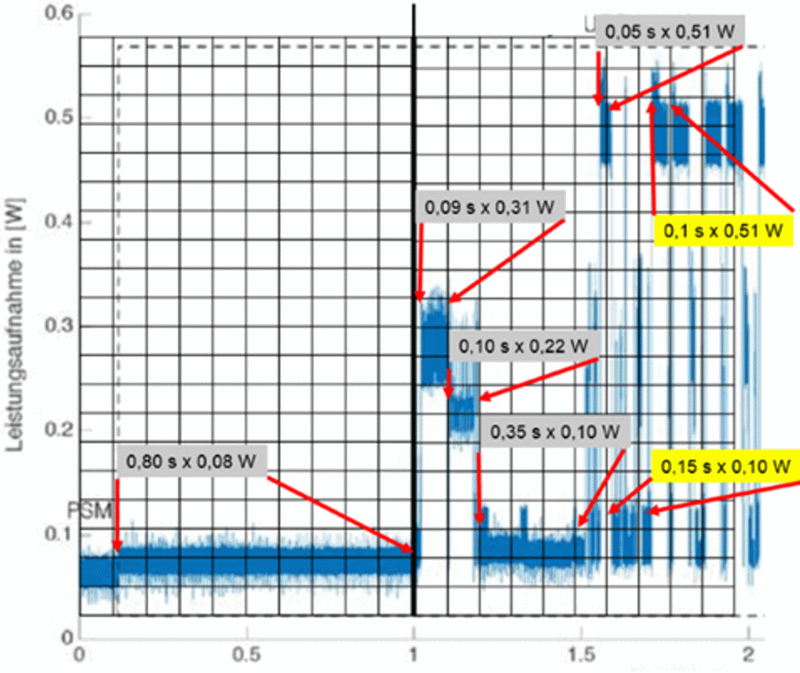 Any package loss by inference, Aloha effect, missing base station and non-synchronised transmit will add power consumption on top of the upper calculated energy consumption. NB-IoT, SIGFOX, LoRaWAN, and Weightless will charge less energy than some bytes by text message (SMS) or GPRS. In comparison to GSM/GPRS, they are all low power. However, energy is power x time. It is Voltage x Ampere x Time. As faster the job is finished as faster as lower is the energy consumption. NB-IoT is at 154 dB link budget with 6000 bps already 60 times faster than SIGFOX EU on its ultra slow 100 bps. Even with its attachment to the BTS NB-IoT will forward 12 bytes much faster than SIGFOX. At 144 dB link budget NB-IoT will already transmit on 21000 bps. NB-IoT on single tone is 210 times faster than the old SIGFOX protocol. SIGFOX is complete static in the communication speed, in TX power level, and the size message container. NB-IoT, LoRaWAN, and Weightless will balance the parameters and change the communication speed to save airtime. Lower airtime will reduce the energy and minimise the risk of collisions of packages on the unlicensed band. NB-IoT, LoRaWAN, and Weightless over dynamic message containers and will be able to transmit more than 12 bytes in one message. As soon you try to transmit more than 12 bytes than the protocol header of SIGFOX will be repeated again. Moreover, NB-IoT will balance the TX power level of maximum 23 dBm step by step. The 14 dBm or 23 dBm at SIGFOX is completely static. A SIGFOX module will transmit on full TX power level even in one-meter distance to the gateway. Weightless and NB-IoT are on TDMA to avoid collisions with “friendly” nodes. Weightless use Listen Before Talk on top of its TDMA and will not transmit on a busy channel. SIGFOX and LoRaWAN do not care about collisions and hope that the transmitted packages will be received. LoRaWAN gives you the option to use an acknowledge on every message. SIGFOX use the hope principle and is not able to acknowledge each message. Any loss of a package and any repeating of a message means burning energy as well. However, we hope that the upper text helped you to start to think about of energy consumption at your wireless IoT application. If you like we can help with wireless modules and BTS/Gateways for the upper mentioned LPWAN technologies. Even with a legal private BTS on NB-IoT. Has this article piqued your interest? Do you plan your own LPWAN IoT device? Do you plan to deploy IoT devices with embedded antennas? Do you have an IoT prototype and need to optimise the design or minimise the price? Do you have an IoT prototype and need to decrease? If you have answered YES to any one of these questions then please do not hesitate to drop an email to harald.naumann (at) lte-modem.com and to ask for a proposal or some engineering services to make your IoT idea a cost-effective reality. Very interesting article. Very critical and definitely one of few sources online showing extended power use caused by Sigfox replica messages. Dear Paul, thank you for the feedback. To compare SIGFOX with LoRaWAN is easy. To compare it with NB-IoT is difficult because the information about energy consumption of NB-IoT is still rare. However, SIGFOX is completely static and not the LPWA protocol with the lowest energy consumption for sure.